In short, IT infrastructure refers to the complete collection of hardware, software, networks, data centres, facilities and related equipment used to develop, operate, test, monitor and support your business. Data Centres traditionally consist of lots of different types of hardware, such as user desktops connected to your network or server. The aforementioned server is normally installed locally, (on your premises) and will provide all employees using the hardware with access to the business applications and data. If you have this model, you may be aware that you have to purchase additional upgrades and hardware in order to scale up and grow as a business. Mandatory software upgrades are required with this traditional IT infrastructure model and this is generally to ensure that the most up-to-date, secure and fail proof systems are in place; something that will become more important than ever before with GDPR being rolled out in the coming months. These are the various different types of systems and programmes that you and your colleagues or employees use on a day to day basis. The most common examples of infrastructure software are database programs, email and other communication software and security applications. It’s key your applications are part of your IT infrastructure. This layer contains key infrastructure services, including Data Host Configuration Protocol (DHCP) and Domain Name System (DNS). Other tools for configuration management, monitoring, authentication are often used to ensure all elements are managed efficiently. This layer consists of both physical and virtual Servers for local and virtualised Data Centre environments. A server is a computer that serves information to other computers. These computers, called clients, can connect to a server through either a local area network (LAN) or a wide area network (WAN), such as the Internet. At this layer, systems such as Network-attached Storage (NAS) or Storage Area Networks (SAN) enable data storage. Within your business you might store hundreds, even thousands of files and it’s important to have not only enough storage, but a safe and secure form of storage to keep confidential information away from prying eyes. Your network devices include a number of inter-connected elements. These include routers, firewalls, switches, access points and load balancers. You might never get “hands on” with these yourself, but the chances are that you use them every single day and – in the case of routers and firewalls – they help to keep you connected and safe. The physical data centre facility houses your IT equipment and includes all of the essential power needed to run your devices, security components and cooling systems. There are plenty of practical benefits to cloud computing, but using the Cloud is a far more complex solution. Instead of having everything we’ve discussed hosted locally, (i.e. on site), everything will be stored in the ‘cloud’, off site. Put simply, the cloud is a real time virtual environment hosted between a number of different servers, concurrently. It’s great for those who are working remotely or who wish to access files from different locations. Traditional IT infrastructure still leads the way in terms of importance and just how much it has to offer. That isn’t to say that the cloud is not a viable option. After all, it can save considerable amounts of money in your early days as a start-up as you don’t have the hefty outlay for hardware. Instead of splashing the cash on expensive IT infrastructure you can rent the data storage space from cloud computing providers instead. This is far cheaper in the short term and there is no physical space required making it generally more cost effective short term. It also offers benefits such as resilience and data security. The information and applications stored in the cloud are typically evenly distributed between all servers, which work as one, and are often more accessible and secure as a result. So if one server fails, your data is safe and you have avoided any downtime which saves you money. You’ll also find yourself in a more flexible position as your business grows as you can invest in more storage without the bulk cost of further hard drives, servers and facilities. That said, what many businesses are now doing is taking the best from both of these solutions and developing hybrid approaches. The cloud is perfect for mobile access to applications and data, whereas an on-site server is ideal when high levels of customer service are needed. 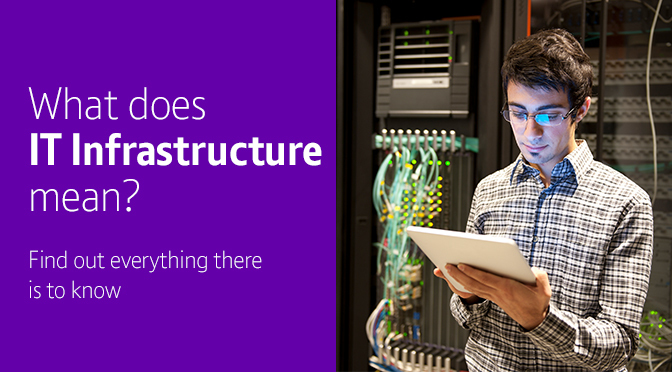 Want to learn more about IT infrastructure? Give one of the Business Direct team of IT specialists a call on 0870 429 3010.